A beast of a game? Like us, you were probably pretty excited when you heard about Disney Epic Mickey: Power of Illusion for 3DS, a new 2D platformer from Monster Tale studio DreamRift. Now Disney has released a few more details on this intriguing upcoming title. The previously revealed painting mechanic involves sketching on the touch screen before the object is rendered in full 3D on the top screen. 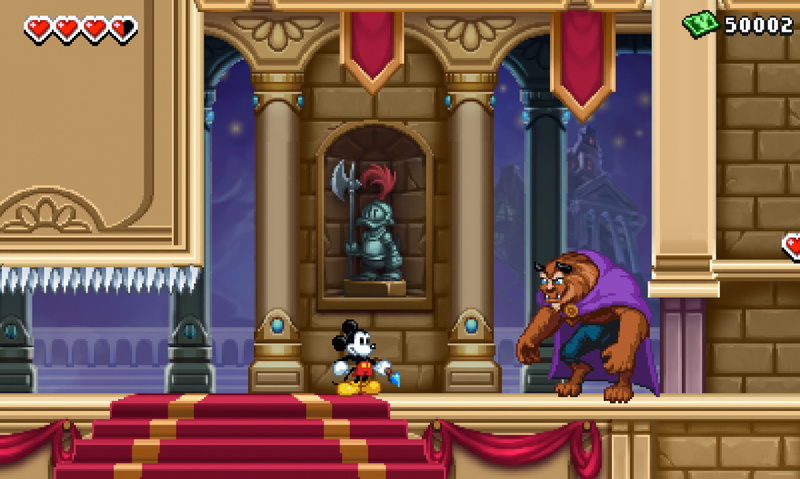 Warren Spector and Disney are calling the game a "tribute" to the original Castle of Illusion Starring Mickey Mouse, rather than a straight sequel. We've also got the first direct feed screenshots below these very words. Are you still excited for Mickey's 3DS adventure? BURBANK, Calif.--(BUSINESS WIRE)--Disney Interactive Media Group today announced the development of “Disney Epic Mickey: Power of Illusion,” the first Nintendo 3DS™ title in the “Disney Epic Mickey” franchise. The title features an interactive combination of painting, dual screen integration and 3D transformation capabilities designed to give players the unique ability to create objects and even characters they can place in the world of Wasteland. “Disney Epic Mickey: Power of Illusion” is being created by critically acclaimed DS developer DreamRift, in collaboration with Disney Interactive’s Junction Point. The game is slated for a fall 2012 release on the Nintendo 3DS. For more information, go to www.disney.com/disneyepicmickey, or check out this month’s issue of “Nintendo Power” magazine which features an exclusive cover story on the upcoming game. I love a good hand-drawn game. If the 3D effect is like that of Mighty Switch Force!, then this will be another great example of hand-drawn 3D done right on N3DS. I'm looking forward to this title. By the way, Pete should be careful. Bowser might sue him for stealing his Thwomp idea. Looks great. It really retains that SNES-vibe. Can't wait to get this game. Definitely pre-ordering this game. Man I love Mickey Mouse and I loved Epic Mickey. “The original ‘Castle of Illusion Starring Mickey Mouse’ changed the face of video gaming... "
I don't know if I'ld go quiiiiite that far, but it was a very good game. Gameplay-wise, I liked the SNES 'Quest' games a bit better, but Castle of Illusion (as well as the somewhat-sequel, world of illusion) has a fantastic atmosphere about it. This game is gonna be awesome! It looks amazing, and I can't wait to play it. This looks and sounds great. I'll preorder as soon as I get the chance. Also, here's hoping Castle of Illusion gets released in the VC. They really should include the originals as unlockables. This looks like what a real game is made of! Reminds me of the SNES for sure. I´m so sad. Why will this not be in 3D? This game is getting more interesting to me each time I look at it. 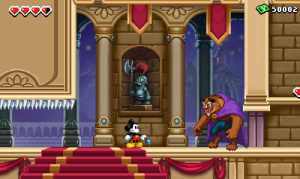 Besides the fact that this game is paying it's respects to a great game before like Castle Of Illusion , more of these classic Disney characters that I see keep popping up remind me that of the characters of the different Disney worlds you would encounter in Kingdom Hearts. I mean, besides Scrooge McDuck and Beast now showing up, I just saw Captain Hook and I believe a statue of King Triton from The Little Mermaid in my most recent issue of Nintendo Power, which I didn't quite understand why they would include in the game whether it has to do with Disney or not. Let's hope this game has that kind of Castle Of Illusion feel to it that we all remember back in the days when we played it on GENESIS and GAME GEAR. I believe it was also on Master System back in the day also, but all in all, I hope this game delivers right. Lookng more forward to this than I am the new Epic Mickey for Wii. I still stand by my stance that the 3DS could do better graphically. Way better. There are downloadable games on the platform that look prettier than this. its far FAR behind rayman origins in 2D art quality. This game looks fun but after the Original Epic Mickey was overhyped for me I should just tread carefully with this game. The graphics remind me of Kingdom hearts chains of memories. Now I really want some classic Disney games to hit the VC. Absolutely gorgeous! I often miss the colour of 2D games from the 16bit generation. Unless something goes horribly wrong here, this will be day 1 purchase for me! DarkWing Duck BETTER be in this game!!!!!!!!!!!!!!!!!!!!!!!!!!!!!!!!!!!!!!!!!!!!!!!!!!!!!!!!!!!!!!!!!!!!!!!!!!!!!!!!!!!!!!!!!!!!!!!!!!!!!!!!!!!!!!!!!!!!!!!!!! Is that a Captain Hook boss battle!? File this under the list of "My 10 Most Wanted 3DS Games Imaginable"
@Shonenjump86: Instead of waiting for them to hit VC which they more than likely wont why not just pick up a NES and a cartridge of the games? Thats better than sitting around and wishing they release the stuff. I so cant wait for this game to come out. I am not to interested in the Wii version. Looks very much like a game from the 16 bit era. As someone who played a lot of SNES and Genesis as a kid, this looks right up my alley. Mighty Switch Force gave off this same vibe, and I enjoyed that, so this is definately on my watch list. If I only have the money for one Disney game this year, KH:DDD trumps this hands down (IMO), but I hope to have the money for both. Yeah... Those games may not hit the VC with all the license issue and stuff. I just hope this game is good. would really look better in 3d but seems promising. 2D platformer = win for me. I still love Castle of Illusion on the Mega Drive, so this should be right up my alley. I just added this one to the list of games I'll be checking out at E3 in June. Gorgeous? Or Henry Hatsworth re-skin? Either way, more 2D platformers better be on the upside.. por favor. I've been waiting for this since i beat Disney's Magical Quest Starring Mickey Mouse... one of my favorite childhood games, definitely. This looks beautiful. 3D ... as in rendered in polygons? No thanks, I prefer the 2D art style. The 3DS is obviously very capable of rendering console visuals, but the developers want to keep the Castle of Illusion look. I wouldn't judge the graphics yet for people who are upset by the sprites. It could possibly look amazing in motion with clean fluid animation. @SanderEvers, it is drawn 2D like Wario for Wii. So the only thing here that is an epic fail is your comment. You really gave away your youth by mentioning Skylander's. Didn't have to be Professor Layton to figure that out, btw. For one, Skylander's didn't have top-end graphics and for two it was targeted at little kids, Buy a Sega Genesis off eBay and discover the wonderful world of 2D gaming that you missed out on. Looks very promising. Hope they nail the presentation and gameplay as much as these shots imply. i like the artstyle- very reminiscent to castle of illusion, which was a classic on the megadrive/genesis. so what if it is 2D? it suits it well and though i love 3d graphics, 2D is what i love most because i grew up with that. yeah maybe youre right. so far screenshots on 3DS rarely impressed me anyway. kid icarus looked okay in screenshots. but platying it with 3D its another world. sometimes it looks even better than a lot of ps3 titles. Seeing these screenshots really takes me back to the mid 90s, leafing through issues of Nintendo Power/GameFan/Gamepro/EGM, looking at the gorgeous SNES graphics of all the hottest upcoming games. It's probably too early to say, but I applaude the direction this game is going in, and on top of that, Dreamrift has proven well it's up to the task of preserving the feeling of all those great 16-bit platformers. I urge all of you to seek out Henry Hatsworth and/or Monster Tale; some of the finest 2D action on the DS. I'm also hoping Konami realizes that 2D sprite based graphics still have a place on the 3DS, and gets IGA working on the next Dractroid STAT! I can't really see the beauty. The style and colors are good, but.. Why make a game with pokémon diamond and pearl graphics? They could at least make the pixels less eye-catching? "Looks like a GBA game" is an insult now? Most GBA games look better than most DS games. Great 2D art simply ages better than 3D. I can't wait to get my hands on this. I really enjoyed Henry Hattsworth and Monster Tale. Couldn't agree more with you Spark_Of_Spirit.